As leaders of G20 nations converge in Seoul for their bi-annual summit, one of their biggest tasks will be to strengthen macro policy coordination, consolidate global economic recovery and promote strong, sustainable and balanced growth. The stakes are high. Leadership and the spirit of cooperation is what the world needs. Some heavy weight economic commentators see a link between "manipulation" in China's renminbi exchange rate and the global economic imbalances. 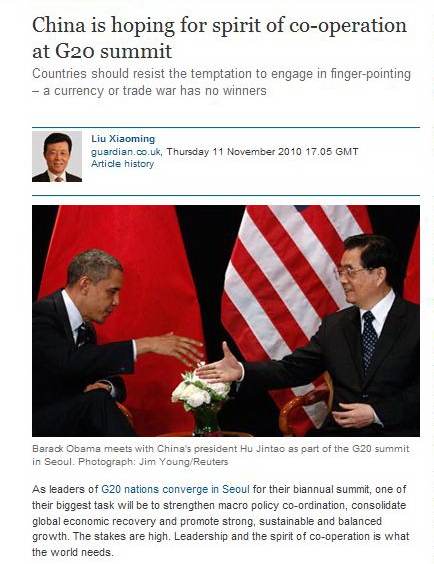 Some call on China to allow its currency to appreciate substantially. The underlying assumption of these arguments is that renminbi revaluation would help to redress global economic imbalances. Let me join the discussion by sharing the following thoughts. There are basically three forms of imbalances. First, the imbalance between consumption and saving. Some countries borrow and consume too much, which was an important factor in the recent financial crisis. Second, the imbalance between the virtual and the real economy, caused by disproportionate expansion of the virtual economy. This has inflated an enormous bubble that was a leading cause of the financial crisis. Third, the imbalance in international trade, between the ballooning trade deficit of the US on the one hand and rising trade surpluses in the emerging economies of Asia, and in oil exporting countries. And there are imbalances in the development between the North and the South, imbalances in the international monetary system and international division of labour. These imbalances by nature can hardly be redressed by renminbi revaluation as called for by some politicians and commentators. We can look at some facts. The renminbi appreciated by a total of 22% against the US dollar since July 2005 when China introduced exchange rate reform. Yet, according to the US Department of Commerce, 2005-2008 saw a growth of US$65bn in the US trade deficit with China. The appreciation of the Japanese Yen in the 1980s and 1990s did not do much to reduce Japan's trade surplus, either. Chinese exports are mainly low-value-added products which are no longer produced in developed countries. Even if China stops exporting, other countries will assume this role over time. Most of China's trade surplus is produced by Western multinationals in China. For instance, an Apple iPod made in China is sold at US$299 in the US. Most of the profit goes to the American company and its employees and retailers, while the Chinese manufacturer receives only about $4 per iPod for its work. Furthermore, although China has a surplus in the trade in goods, it has a deficit in the trade in services and in general trade. It has a surplus with the US and the EU, but a deficit with Japan, South Korea and the 10-member nations of the Association for Southeast Asian Nations. This shows that trade imbalances are not caused by the exchange rate, but rather are a matter of the globalised trading structure. China is committed to the reform of its exchange rate system, which will proceed in a gradual and market-based manner and at a pace consistent with China's international balance of payments position. It would also be helpful for major importing countries to relax export controls on high-tech products to China, as this hinders their ability to make full use of their comparative advantage. Given the fragile and unbalanced global recovery, countries should resist the temptation to engage in finger-pointing or blame shifting. A currency or trade war has no winners. China contributed 50% to global economic growth last year and its continued growth is crucial to a steady global recovery. A one-off appreciation of 25 to 40% of its currency would be a major act of currency manipulation that would set back China's exchange rate reform and have a destabilising effect on the Chinese economy. This would do nobody any good. Cooperation is what matters. Both surplus and deficit countries have a responsibility to act to tackle the underlying structural imbalances in their economies, wherein lies the long-term solution. China has in recent years made vigorous efforts to restructure its economy and boost domestic consumer spending. The recent 5th Plenary Session of the Central Committee of the Communist Party of China reaffirmed China's commitment to build long-term structures to boost consumer demand, and promote steady and fast economic development through the balanced growth of consumer spending, investment and exports during the 12th Five-Year Plan period (2012-2017). China has also taken measures to improve public services such as health care, old age pensions and education to reduce the need for precautionary savings by the less well-off. This will, in time, release greater spending power by its population, which will have a significant impact on the world. At the G20 Summit, countries have a major opportunity to show to the world that they remain inspired by the spirit of cooperation that characterised the world's response to the immediate financial crisis and that they will work together on the basis of mutual benefit to tackle major challenges to the global economy. China will continue to engage in international cooperation and contribute to a successful Summit at Seoul and faster global economic development.